The 2018 Firearms News Treasury Eighteenth Annual Edition is packed with more than two-dozen articles on firearms history during wartime, exciting gun reviews, and rare firearms from single-shots to machineguns! 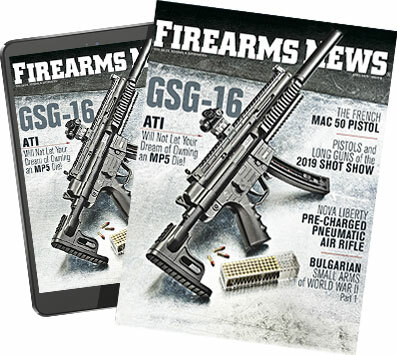 David Fortier, editor of our survival magazine, Be Ready, gives his recommendations regarding truck guns to help you get to where you are going when the SHTF, as well as his expert firearms reviews in a few more articles. Our firearms historian, Paul Scarlata, takes you on a journey through time back to the days of WWII, and examines the variety of firearms used by the Japanese, Dutch, Poles, French, and Americans in six great articles. Firearms New also welcomed a very well-known firearms author/writer who has been writing for over four decades -- Leroy Thompson tests a reenactor's dream, a semi-auto MP-40 in pistol form. Pat Sweeney keeps things quiet with his great suppressor tests and Jim Tarr is also back in the Treasury this year with his in-depth firearm T&Es including a cover story on three awesome CZ pistols! Our gunsmith, Gus Norcross, visits the most popular custom retro arms manufacturer, plus many more great articles and the one and only "Paper Gun Show" in the firearms industry since 1946!